I don't think handedness is determined at such a young age. Most babies do things with both hands, though he could be a lefty! The British royals need more lefties as they only have William and Sophie and I believe Bertie (George VI), though I believe he was forced to use his right hand. I don't think there are any more are there? Charles and Anne were also a part of the generation were left handedness was seen as "weak" so even if he was naturally left handed, he would have been made to write with his right. (My father is of that era and is naturally left handed and is now ambidextrous.) By the time Andrew and Edward were born, even though neither is left handed, it was more "acceptable" as Sophie remained left handed. How do you teach them to eat their food with their right hand? Well I never did. I offered them a spoon or fork to use. And at first they would grab and use it with their left hand (I always sit on their right side) and after a while they started to use their right hand. Is there anything genetical about being left- or righthanded? Oh I always assumed a baby just developed their hand preference naturally. I remember I believe Arthur Edwards saying he was the first to figure out William was left handed when he was almost 2. George grabbed Kates hair with his left hand but at the Polo game he grabbed some stick with his right hand. Yes, left and right handedness is genetic. About 50% of my family, including cousins, aunts, uncles, etc., are lefties. It's a very high percentage. Many decades ago, teachers (at least, in parts of the US) used to force children to write with their right hand and they later found it was not best for the child. The best, is to let the child naturally gravitate to and learn to use utensils, etc. with which ever hand they prefer. Interesting. I was the first person from both sides of my family to be left-handed and it took another 10 years before there was another one. Just as SLV said "I offered them a spoon or fork to use. And at first they would grab and use it with their left hand (I always sit on their right side) and after a while they started to use their right hand." Maybe it isn't teaching after all if you play with their minds, I think they will slowly change from left to right, but yes, sometimes it is genetic. My father-in-law had the same experience. Regarding left-handers - Edward is also a leftie. 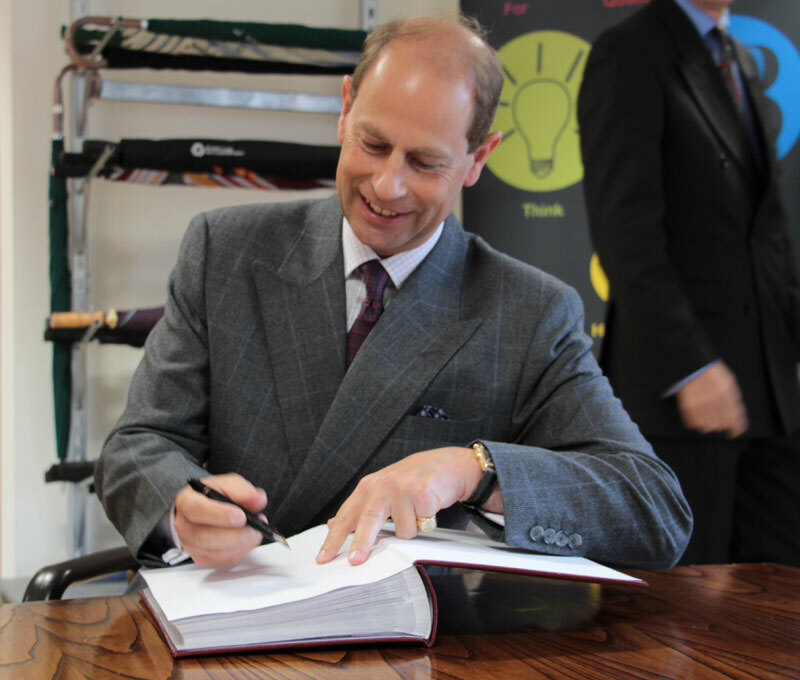 Here he is writing with his left-hand. Oops - that is actually the result of being changed from a leftie to a right myself - I have trouble with left-right at times - and this was one of those occasions. I have been known to give some one directions and say 'turn left' and point with my right hand and vice versa. Why would anyone play with a child's mind to change their preference from left to right? There is nothing wrong with lefthandedness???? Unfortunately there was a time when it was considered a flaw that had to eliminated. "Normal" people did not write with their left hand. I love a saying I saw once - "If the left side of the brain controls the right side of the body, and the right side of the brain controls the left side of the body, then only left handers are in their right minds"
I don't have anything against lefties. I can write and do things with both hands, so I'm a right-handed and left-handed. But the enviroment I grew up with, was kind of strict, and those who were lefties were considered "not normal". I was originally a right-handed but I went against the system when I was a child and started to eat diferently (a knife on the left hand and a fork on the right), and thus my left hand is able to write and do lots of things. But on my opinion you can "control" which hand the babies will have preference with, just saying, because I saw what my parents did. For example they would give me and my brother a pencil on the right hand, when we switched, they will switch us back, etc... Well, until we were too used to the right hand, so that the left hand is from then on useless. Queen Mary's father was Prince Francis of Teck. Francis, Duke of Teck had the name of Francis Paul Charles Louis Alexander. So Prince George has two names of Prince Francis': Louis and Alexander.